It has been more than 2 years since I became Deputy Director for Fisheries at the Environment Agency – the best job ever, by the way. When I started it was very quickly apparent that if we are to achieve our ambition for fantastic fisheries and angling in England we need to work in partnership more. By working with partners we can play to different organisations’ strengths, make our money go further and deliver more – so why wouldn’t we? Working with our great partners on the England Fisheries Group, including Defra, the Angling Trust, Rivers Trust, Canal and Rivers Trust, Atlantic Salmon Trust, Salmon and Trout Conservation UK, Wild Trout Trust and Institute of Fisheries Management, we came up with a new partnership approach for delivering our fisheries service. The Environment Agency Board approved this new approach last November. One of our first opportunities to use this approach in earnest came with the results of the 2014 salmon stock assessment for England. Salmon are a protected species and an iconic indicator of the health of the water environment. The 2014 assessment showed a further decline in salmon populations. 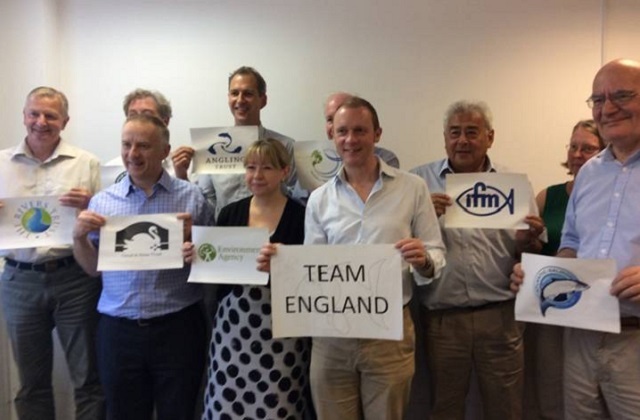 So in November 2015 we held a summit to discuss the future of salmon management in England. This important meeting brought together Government and Environment Agency leaders, leaders from NGOs, other partner organisations and stakeholder groups with an interest in salmon and their dependent fisheries. We recognised the need to take a new and re-invigorated approach to salmon fishery management and conservation, using our partnership approach, and the ambition of Government, to create a healthy, vibrant environment that encourages sustainable economic growth. Over the last 20 years, there have been success stories – such as the improvements recorded in salmon populations, including on the Rivers Tyne, Mersey and Don where water quality and river habitats have been restored. But there is still more to do. So ‘Team England’, as we fisheries partners call ourselves, has developed a new approach to addressing the pressures impacting salmon fisheries across England. The salmon five point approach describes the high level commitments, the necessary actions and key measures to improve the future for salmon. The pressures affecting salmon stocks have not changed in recent years but now our approach has - and the future of this iconic species is looking brighter. Try removing fish farms and estuary nets they do far more damage than anglers to salmon stocks!!!! This is indeed, quite heart warming to see these initiatives implemented, we are 'all' responsible to ensure there is a future for migratory fish. Our children, grandchildren and great - grandchildren, should be given the same wonderful opportunity that we have experienced with reference to game - fishing. Even though there has been an exponential decline in numbers, we are still quite privileged to fish for both Salmon and Sea Trout. Please endeavour to keep up the good work, I will most certainly do my bit! Mass predation on all the river . Future of salmon fishing looks very bleak. 1 . stop all netting at sea to cover people's job losses increase rod licence money . 5 open a hatchery to stock all uk salmon rivers . If it's done right they do work only have to look at keilder hatchery. The 5 point plan put forward is likely to fail on several counts. 1. Improved marine survival could be years away unless there are tighter controls imposed on salmon farming. 2. How can we take the EA seriously on further netting controls. When mandatory catch &release until the 16th of June was brought in for rods on all rivers, net fishermen were allowed to start on the 1st of June, when nets take abundantly more salmon than rods, and kill every fish. Catch & release by rods has been increasing year on year, and is now at its highest level ever. 3,4,5 These improvements have been carried out over a number of years by the EA, and if not, why not? Anglers also play their part, unfortunately, as stakeholders we are very rarely listened to. 6. Greater effort on reducing predation (off shore & in river). 7. Allow the use of 3rd party hatcheries to re- stock rivers where stocks are reaching a critical level. It was said at the Glasgow conference "Hatcheries are a management tool, and should not be thrown out of the tool box". It would appear to an increasing number of anglers that the EA has already taken this step. Is this a new approach? Are not these initiatives the ones you should have been addressing already. The state we are in with our salmon rivers is because of Governement(EA in England ) neglect and in Scotland the salmon farm debacle that goes on virtually with no environmental safeguards and its a disgrace. I agree with much of the above by Jamie Howe though I do not believe 100% catch and release is working on those rivers that have it.Can anyone show it is. Try looking at the riverTees. Inadequate fish ladder,protected seals eating all the salmon as they wait to use the ladder,salmon count for 2015 -370, compared to 1000,s on other rivers. Solution install a better ladder,find a way to prevent the seals getting access to the waiting salmon(how about a steel cage or mesh barrier big enough for salmon but too small for seals? With respect, if the pressures affecting salmon stocks in recent years have not changed then perhaps you may enlighten us all as to why year on year returns are declining? Stocks are coming under vastly increasing pressure and your organisation fiddles while the species burns. I will stick my neck out and suggest that the future is not looking brighter for the species. It is looking decidedly grim until your organisation stops coming up with ill thought out, back of a fag packet schemes that lets face it nobody really takes a blind bit of notice of and starts making a real difference. While that would indeed be refreshing I don't ever see it being put into practical operation. It's not a great worry though as the generations following us will be able to see salmon in a glass cabinet at some natural history museum. Just to clear things up, in my earlier comment, the 5 point plan I was referring to was that of the EA and not the comments left by Jamie Howe, who I totally agree with. To highlight the problem we face, the 10year average rod catch on the Cumbrian Derwent from 2004/2010 was 1258. In 2014 this number had crashed to only 288, with 2015 predicted to be even worse (no official figures yet). Many thousands of pounds has been spent on habitat improvements over a number of years, with C&R rates increasing to around 85/90%. None of these measures have halted the rapid decline in salmon numbers. Come on EA get real. Correction! The above comment should read "SEVEN years from 2004/2010" It just goes to prove that more than the EA can get things wrong, but not quite so seriously. I agree that linking rods to the exploitation by nets says it all about the EA mentality. I hadn't realised that seals were such a problem. I have read with interest the above and entirely agree with Jamie Howe. The sad fact is that it is far easier for bureaucrats to avoid the really tricky subjects and fiddle around the less controversial edges instead. The same is true of threats to bird life, such as the Curlew (red listed). A great deal is written about habitat, but predation, especially avian, is glossed over, and Game Keepers are often vilified. So here we have the same situation; the real culprits in reducing salmon stocks - over fishing in salmon feeding grounds, seals in river mouths, nets at sea, cormorants and, worst of all on the west coast of Scotland, fish farms, receive scant emphasis in Sarah Chare's 5 point plan. Though nets are mentioned, they are linked to rods, tarring fishermen with the same indiscriminant brush as netting; I have not kept a caught salmon for a number of years. So come on Sarah; show some steel and get to grips with the problem. Go for the real culprits in all this and create for yourself and your staff a legacy to be proud of: a genuine and lasting recovery in the Atlantic salmon and migrating trout fortunes - this in addition to the actions already in the plan. Sad thing in all this is all the anglers who have good knowledge and who spend the time on local rivers can see and no were the problem lies but ea don't care as long as licence money keeps rolling in they not bothered. none of them do the right things sit back think of summit that might help a handful of fish . Action needs to be taken now if u want wild salmon to survive. Catch and release has never been higher we all doing our bit if it means we all have to put them back till stocks improve so be it. Till the ea get to grips with the real problems it will continue . While the money keeps coming they will sit back and do nothing but right plans up that havnt got a chance of working . 1. Marine Survival. I sincerely hope that the term 'Marine' includes the estuarial and near-inshore zones where the highest attrition of both outgoing smolts and incoming mature salmon occurs. The most recent Canadian research component of the SALSEA project starkly highlighted this factor. I would not wish to see the EA spending taxpayers' money on pursuing 'will o'the wisps' on the high seas when work closer to home will yield much better returns. The highest priority must be to address the effects of the Scottish west coast salmon farms, including lice infestation of passing migrants, transmissible diseases and the genetic consequences of escapes, all of which undoubtedly impact fish from rivers in the North West of England (and Northern Ireland as well). The fact that Scotland lies beyond the EA's remit should not allow this issue to be ducked. 2. Nets and Rods. The salmon netting industry is now a mere shadow of its former self as a result of the economic impact of aquaculture. While much is made of netting as a factor, the statistics don't stack up: having studied 50 years' data on 3 Scottish rivers in great detail, the effects of the cessation of netting were mathematically undetectable. To suggest that rod angling has any impact whatsoever on salmon numbers in England is frankly laughable, the more so when it is set against other forms of attrition. There is no mathematical evidence whatsoever to prove the efficacy of mandatory catch and release, and to date the pre-16th June prohibition has had no measurable effect on stocks. I am all in favour of anglers showing restraint,which nowadays is commonplace (I haven't killed a salmon since 2013) but I cannot accept the contention that reducing anglers' minimal attrition merits any mention in what should be a serious evidence-based plan. Furthermore, it ill becomes the EA, which funds only one Enforcement Officer for the whole of North Yorkshire to counter poaching, to suggest that the limitation of legitimate angling is more important than the prevent of crime (each year poachers on the Tees take at least 10 times more salmon than anglers). 3. Barriers to migration and habitat improvement. Now we are getting to the areas that really matter. The rivers of England are littered with redundant dams and weirs, some dating back hundreds of years. The removal or by-passing of these obstacles, especially in feeder and spawning tributaries, will not only ease migration but also open up many more hectares of spawning-suitable streams, which will directly impact the population potential of the river system. Some obstacles like the Tees Barrage are of modern origin and extremely damaging. There is still a long way to go on habitat improvement, which of course is directly linked to water quality. Perhaps the development of a post-BREXIT national agricultural and economic policy could include habitat enhancing measures (e.g. uncultivated headland strips alongside all water courses). Certainly agriculture and water quality must be considered holistically: intensive dairy farming and salmon do not go together as the Exe, Torridge and other West Country rivers demonstrate. 4. Safeguard flows. No salmon river has ever benefited from abstraction, which is the bane of the rivers in the south of England that used support large populations of salmon. There are no easy answers in economic development, but we do need to get much smarter in our measurement, assessment and licensing regimes. 5. Water Quality. After World War 2 salmon in Yorkshire were wiped out by ill-controlled industrial and agricultural pollution, especially of heavy metals, bio-mass and oxygen depleting bleaches. The predecessors of the EA declared salmon extinct in the Ouse and Don systems around 1960. The rapid de-industrialization of the 1980s had remarkable consequences in terms of the speed of the recovery of the salmon populations, which now exist in angling exploitable scale in at least 4 rivers in the region. Last October the ascent of large numbers of salmon up Otley weir on the Wharfe became a popular local spectator activity. It is absolutely essential that the UK, which has not distinguished itself within the European WFD regime, doesn't backslide on water quality following BREXIT. Sadly I don't anticipate a constructive response to these comments, but I should be grateful if someone other than a Media Communications Officer would read and digest them with a view to modifying the priorities within the plan. Thank you for taking the time to provide feedback on my blog about the Salmon Five Point Approach (S5PA) and I’m pleased that you too welcome the partnership approach. The approach seeks to address the many contributing factors to the concerning state of our salmon stocks, however, the 5 themes and their actions are all considered important by ourselves and our partners and are not listed in any particular priority. The marine workstsream does as you suggest include the issues within the estuarine and inshore zones. We, together with our partners, including the Centre for Environment, Fisheries & Aquaculture Science (CEFAS) and Government are looking at the pressures in these inshore waters. We have looked at the benefits and outcomes we have seen since the introduction of the spring salmon measures and we estimate that 58,000 salmon have been saved nationally over the last 16 years. As part of the programme of work we are also looking at how we can provide effective enforcement of illegal fishing. We are increasingly working with other Government agencies to be more effective and to make our resources go further. This has already resulted in successful joint operations, sharing of intelligence and prosecutions. The 5 point approach will also look at how we can build on the Voluntary Bailiff Scheme we are putting in place for coarse & trout fisheries to prevent and enforce against illegal salmon fishing using separate private finance. I’m reassured that you agree with the main priorities within the 5 point approach and recognise similar issues. 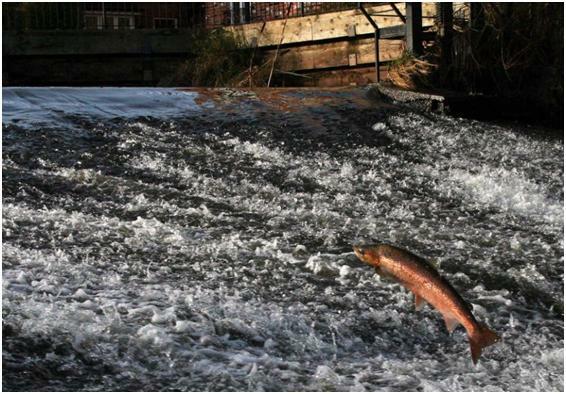 This approach builds on recent successes such as since 2009 on England’s 42 principal salmon rivers, we have altered or removed barriers stopping salmon from migrating upstream to spawn at 82 sites, opening up 5,767km of river catchment. To ensure that there are sufficient flows, we have removed or reduced 77 unsustainable licensed water abstractions on salmon rivers since 2008. However, we know there is much more to be done which is why we have developed the Salmon 5 point approach with partners. This will re-invigorate and concentrate efforts by as many interested parties as possible to help protect and sustain wild salmon stocks in England. We will not achieve these improvements alone and so this approach encompasses work by key partners and seeks to ensure that habitat, flow and water quality improvements fully address the needs of salmon and sea trout stocks. poachers don't take ten times more fish than legal anglers do on the tees each year, because hardly anybody poach's the tees.As for yorkshire only having one enforcement officer,well the reason is that poaching has come to a standstill or nearly has done so,the yorks Esk does have a team of officers,but that is it as far as the ure and swale etc goes,only now when the salmon have returned people are starting to care about enforcement teams,where as in the past people fished all times of the year for all species ie course fishing in mid april ! Think you may be fighting a losing battle---Book of Revelation “And the third part of the creatures which were in the sea, and had life, died; .."
Hope your not using coarse anglers licence money!!!. I used to catch many salmon parr on the welsh Dee and upper severn whilst fly or coarse fishing but not for many years. That said on the upper severn we have seen a return of large numbers of grayling and dace and small chub which suggest more of breeding cycles being affected by environmental factors. So hopefully the salmon breeding may have an upsurge. declining my backside,ive watched the Tyne come from nothing to what it is today and also watched the Tees since the 80s make a comeback same as many yorkshire rivers that enter the humber estuary,lets take a look at the humber it feeds the trent and yorks ouse,but lets look at the ouse,the ouseis the ure same river diff name,the ouse feeds,the wharfe,aire,derwent,river hull and don ok the last two may run directly into the humber but still out of them rivers come smany more rivers and streams that all have a run of some description,some better than others but lets say they doing well,now the river wear with all it many poaching prblems mainly rods has got more fish running since the installation of the first counter back in 1995,the tees is doing better than when they opened the tees barrage as now the fish have better access to navigate the barrage area,So once we had a dead yorkshire other than the yorks esk ok the ouse and ure had odd fish but thats exactly what they were odd fish.the wansbeck and blyth in northumberland along with the derwent TYNE TRIB have now got fish after many yrs of being blocked by dams etc. what gets me is this; we are told about sustainable fishing by the likes of TV chefs like gino d acampo and jamie oliver,but its ilegal now to sell rod caught fish but still ok to net salmon at sea-not very sustainable form where i am sat ! theys no shortage of salmon esp here in the north/east of england,we never had it so good since the mending of the humber estuary-not sure what the trent is doing but from what i head we have salmon doing rather well in that river also-so where is this shortage? cumbria maybe some of the cumbrian rivers have declined slightly or solway rivers that have rivers both sides of the border,ok some southern rivers have had problems but they still producing lots of fish. now if we look at ever increasing prices for a days fishing and free water fast becomiong a thing of the past,we have anglers who dont declare catches in fear of loosing ie club water or syndacate stretches of water or riparian landowners kicking off or fisxing rent for the yr usually free mason types.maybe we need to be declaring more catches as this rubbish of declining fish is one day going to effect everyone who fishes for them as rules are getting tighter seems to me that the powers to be are in the very slow process of closing down fishing and hunting altogther in the uk might not see it in my life time but hey i never ever would have thought a person c ouldnt coarse a hare or deer for the pot with a dog,and now we have a ban on hunting with dogs.....the most ancient way to hunt ! COCO, yes the North East rivers may be on the up, the Cumbrian rivers, Derwent / Eden etc have seen a massive fall in salmon numbers.....FACT. yes yer right and yer gota ask yer selves why? firstly the cumbrian rivers have been in pristine condition,where as north east rivers have took a battering with industrial pollution from the likes of ICI TIOXIDE etc so if we can bring the tyne back to life and now has the rep of thee best in england and wales,the wear well ok its lost its sea trout slightly but they starting to come back but on the up side counts have shown a increase and a trend in more fish arriving earlier like from beggining of may as oppsed to later in may or early june,the earlier fish are salmon spring fish but the wear has never been known for a big spring run as far as im aware,then the tees a river that came back to life in the very late 70s early 80s but only after a belt of pollution in the darlington area,the yorks esk well its had fish since day one,the ouse and all the tribs that go with it wow ruddy wow ! talk about a turnaround,then the swale even more amazing,and every single river and trib that comes off the ouse derwent rye cosd beck river wiske.laver skell and cover to name a few are now all getting runs or massive runs depending on either the main river for greater and tribs for smaller runs but as each year passes the ones that have been left out are now starting to take spawners,then the other river that comes from the humber ouse junction the trent/don/dove etc even the mersey is getting fish,and in europe the rhine is getting fish and that other river that goes through the centre of paris is getting fish,basele in switzerland has had a few spawners for the past few yrs and river that once homed around 5 million salmon a yr,now if all them can make a come back after pollution whats going on over in cumbria? what y'all doing wrang? Our main problem is habitat. We,ve done the research, (DFP Research)) we know the agricultural community is the main cause of aquatic pollution with silt a close second, we know these effect re-production levels, yet we have no political will to address the issue. Land owners and farming provide funding for the controlling political party, they will not bite the hand that feeds them. All else is puff and just as useless. We must stop excessive protection of the main culprit. The answer lies in Whitehall. Honesty, most fishermen, whatever method they use to catch fish, believe that the method that they themselves use is the only method that should be legally allowed. Other methods of fishing should be stopped. (1) rod & line fishing, undoubtably most fishermen use this method. but this must be the most cruel & barbaric way of catching fish,a metal hook is used to pierce the body of the fish, the hook could pierce the body of the fish, in the eyes, in its face, in fact anywhere along its body, quite often the fish swallows the metal hook, ( because the metal hook is covered in materials to make it look like food to the fish ). When the hook is firmly imbedded in the fish, the fish then has to be pulled onto the river bank, or into the shallow water to be killed, or released, however the fish has to be put into a weakened, exhausted condition before it can be hauled to where the fisherman wants it. To tire the fish the fisherman gives the fish line, so the fish believes it has been set free, so it swims away from the fisherman, after a while the fishermen starts to reel the fishing line towards himself, the pain this must cause the fish is indescribable, this goes on until the fish is exhausted, meaning it cannot swim any more, it is often bleeding from injuries caused by the hook, if this procedure is not followed the fish would snap the fishing line and swim to freedom, with the metal hook embedded in its body. If the fisherman manages to land the fish, and wants to practice C & R, by the time it is released it is often too weak, through exhaustion, loss of blood, stress etc to continue on its migratory journey, so the fish will most probably die. So if any type of fishing is curtailed, rod & line fishing should be first on the list. Please lets have a little honesty in the debate. Sounds like you have never fished with a rod in your life. What makes you think a fish feels pain the same way a mammal does? Are you a netsman by chance who humanely allows a fish to die in a net for hours or overnight. Who thinks because his family have lI've by netting as many fish as they could for pure economic gain is ok? Or is it the argument that 300 year old skills would be lost. Well 300 years ago it's financially beneficial to catch hunan beings and force them into the slave trade - I am sure you'd agree that would be a skill we wouldnt care about continuing for old time sake. .